One of the unfortunate results of a divorce involving children are situations in which one parent denies visitation to the other parent or refuses to allow the other parent access to reasonable communications with the child. In Maryland, refusal of child custody may potentially cause serious legal problems for the custodial parent. Maryland Circuit Court judges take parental rights regarding child access seriously, and the Circuit Court judge will generally issue an order that it is in the best interest of the child to spend quality time with both parents. Because the court places the best interest of the child above most other interests when determining custody arrangements, child visitation rights can rarely, if ever be legally denied by the custodial parent. When a custodial parent denies access or visitation to his or her children’s non-custodial parent in violation of a divorce decree or custody order the spouse being denied access may ask the court to order that the non-compliant parent be held in contempt of court. If a parent continues to deny access to the child another request may be made to have the non-compliant parent held in contempt of court which often results in serious consequences for the custodial parent to ensure compliance. If the Maryland refusal of child custody and access continues, the court may potentially order that the willfully non-compliant parent forfeits primary custody of the children to the non-custodial parent. 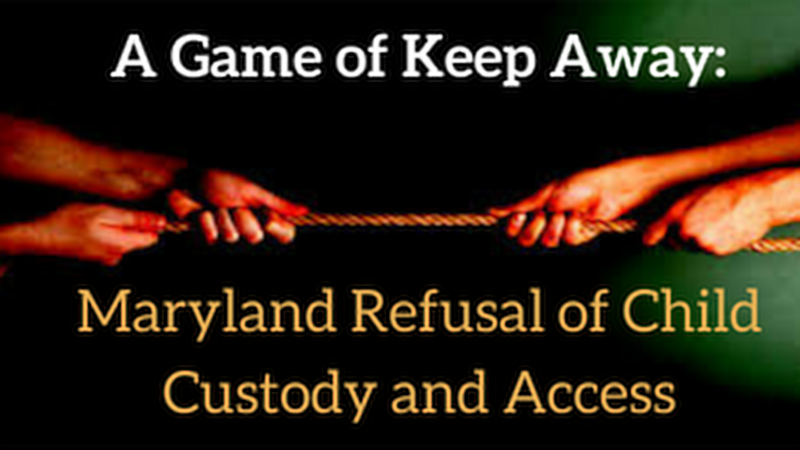 What is considered denial of child visitation in Montgomery County, Maryland and Prince George’s County, Maryland? At the Law Office of LaSheena M. Williams, you can consult with a child custody attorney that can help you address your concerns regarding Maryland refusal of child custody and access. We can help you enforce your parental right to having a valuable role in your children’s lives. Contact the Law Office of LaSheena M. Williams today, to discuss your family’s needs with a Maryland child custody attorney. You can reach our office at (301) 778 – 9950 or by completing an online request for a consultation. Denying access to a child may create an emotionally damaging situation for a child who most likely has no influence over the situation.